Officials and residents gathered at lighthouse Wednesday morning for designation of light as endangered structure. The National Trust for Historic Preservation announced in a ceremony at the Gay Head Cliffs Wednesday morning that it had named the Gay Head Light to its 2013 list of America’s 11 Most Endangered Historic Places. Members of the Gay Head Lighthouse committee, Martha’s Vineyard Museum, selectmen from across the Island, U.S. Coast Guard and town residents gathered under the lighthouse to mark the announcement. The brick lighthouse dates to 1856 (it replaced a wooden tower built in 1799) and today sits perilously near the edge of a rapidly eroding cliff at the Island’s westernmost edge. It is slated to be moved sometime in the next two years. 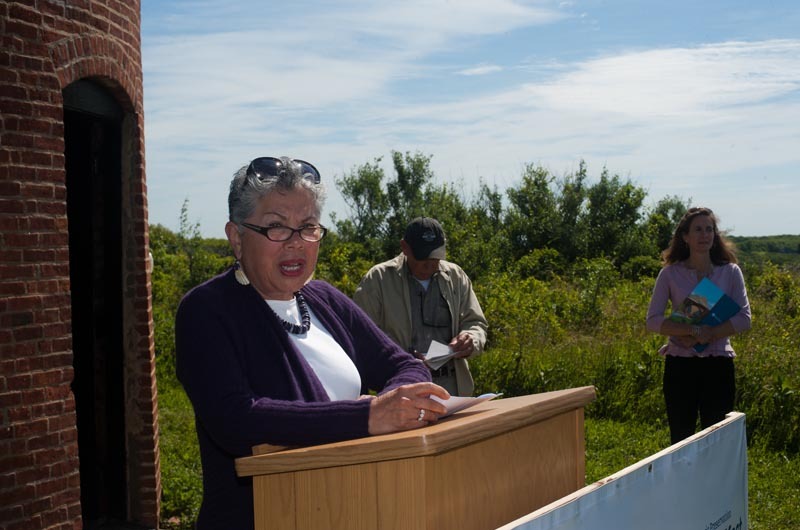 Alicia Leuba, field director for the National Trust for Historic Preservation, called the lighthouse an “iconic symbol” of the Vineyard and said she hoped the designation would be a “powerful tool” for rallying national support. Lenny Butler, who heads a town subcommittee charged with restoring and moving the light, served as master of ceremonies and welcomed the crowd to the historic site. “We are honored to be designated to this year’s list,” he said. The nomination was made by the Wampanoag Tribe of Gay Head (Aquinnah). Beverly Wright, a town selectman who is chairman of the town lighthouse committee, recalled growing up in Aquinnah and spending nights in neighboring fields playing a game of jump the beam. 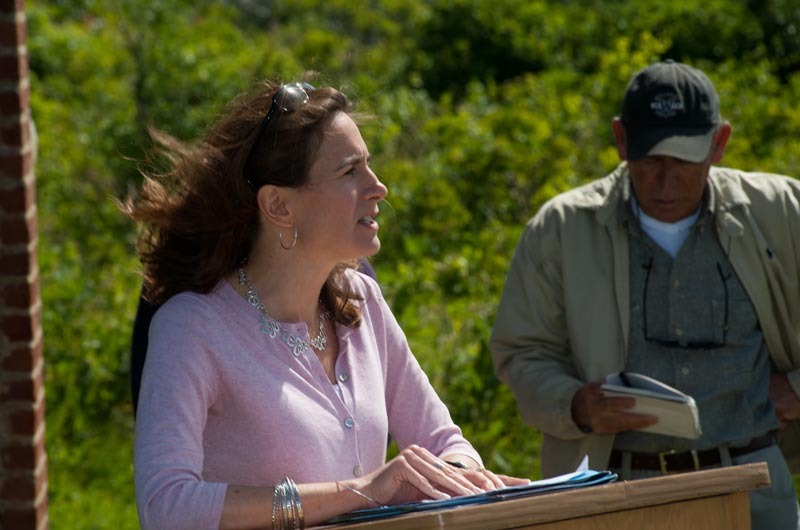 She said efforts to save the lighthouse stretched beyond Aquinnah, and she urged the entire Island to get involved. 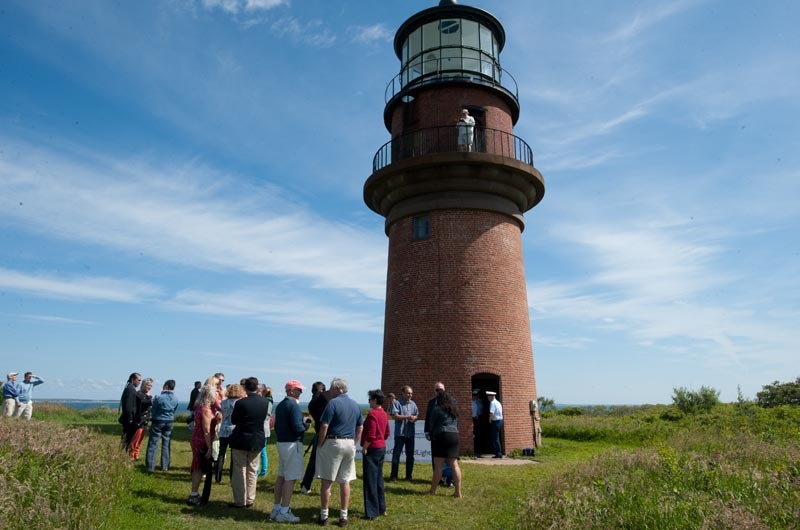 The announcement is the latest in a series of public spotlights on the historic tower, which is owned by the Coast Guard and managed by the Martha’s Vineyard Museum. The U.S. government is expected to declare the lighthouse surplus property sometime this year, paving the way for a transfer of ownership to the town. The next step will be relocation of the light. Geological studies of the cliffs are already underway. President Obama and his family visited the lighthouse in August 2009 when they were vacationing on the Island. The National Trust for Historic Preservation annually names a list of 11 endangered historic places considered “at risk of destruction or irreparable harm.” In addition to the Gay Head Light, the list this year includes the Abyssinian Meeting House in Portland, Me., the Houston Astrodome in Houston, Tex., and the Kake Cannery in Kake, Ala. The designation does not come with funding but could pave the way for future funds to help restore and move the lighthouse. The ceremony Wednesday also kicked off a fundraising campaign and new website for the lighthouse. It is now estimated that about $3 million will be needed to restore and move the structure. The lighthouse committee is investigating funding from private and public funds. “We hope it will raise national awareness for other groups, foundations and individuals who read about it and think it’s important,” he said. For more information or to make a donation, visit gayheadlight.org. Mr. Adshead, I am the Town Administrator for Aquinnah. We are currently working on doing just that - removing the telephone requirement. Please check back with us when the web site has made the necessary adjustment. Mr. Adshead, thank you for wanting to help! Check are gratefully accepted. You can get the postal address at http://gayheadlight.org/contributions/. This is a wonderful community effort. As many people know, I have been involved with saving and protecting the Gay Head Light for decades. Many thanks to the Town of Aquinnah and to the volunteers who serve on the Gay Head Lighthouse Committee.